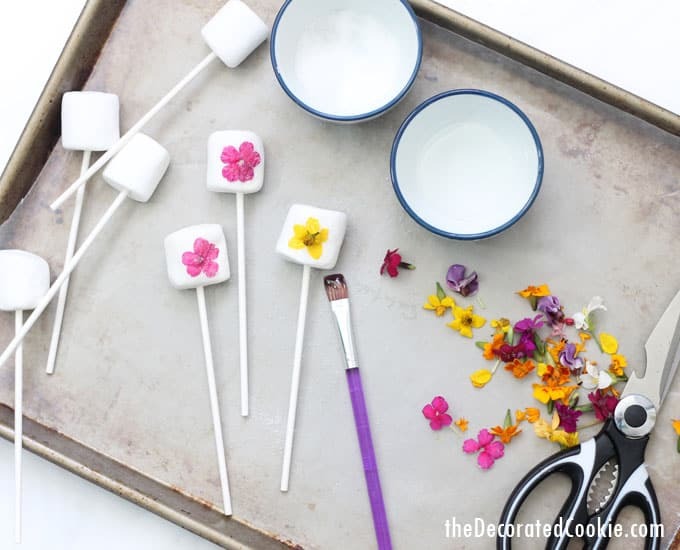 Edible flower marshmallows (marshmallow pops) are a beautiful, easy treat to make for Spring, Easter, Mother’s Day or any day. 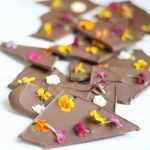 You might think I’m becoming a bit obsessed with edible flowers after these orange cookies with edible flowers and this edible flower chocolate bark. I might be a bit obsessed. 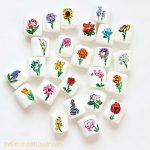 It might also be the case that I ordered my edible flowers and the shipping was expensive, so I wanted to make as many things as possible with them. 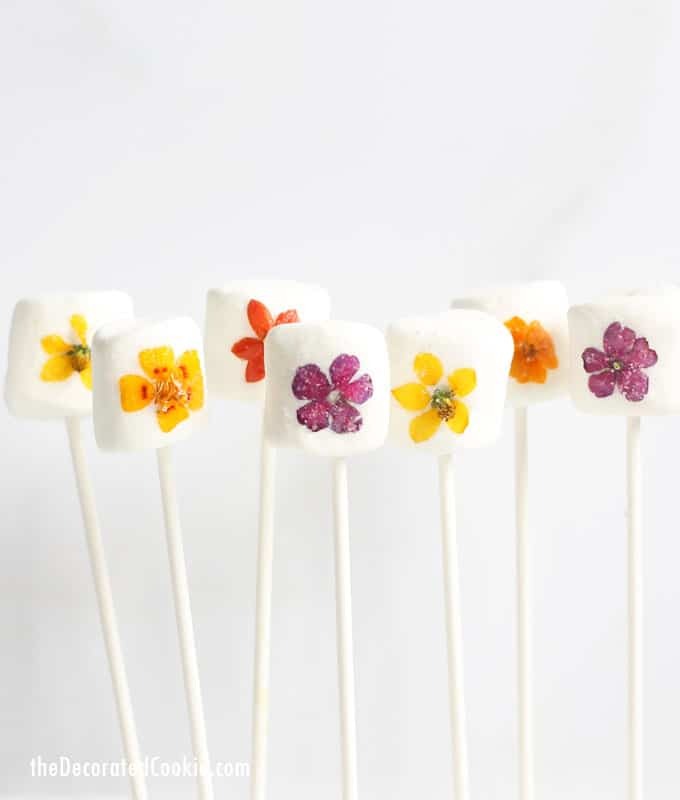 And so, after cookies and chocolate, I give you edible flower marshmallows (on a stick!). These are so beautiful and simple to make. 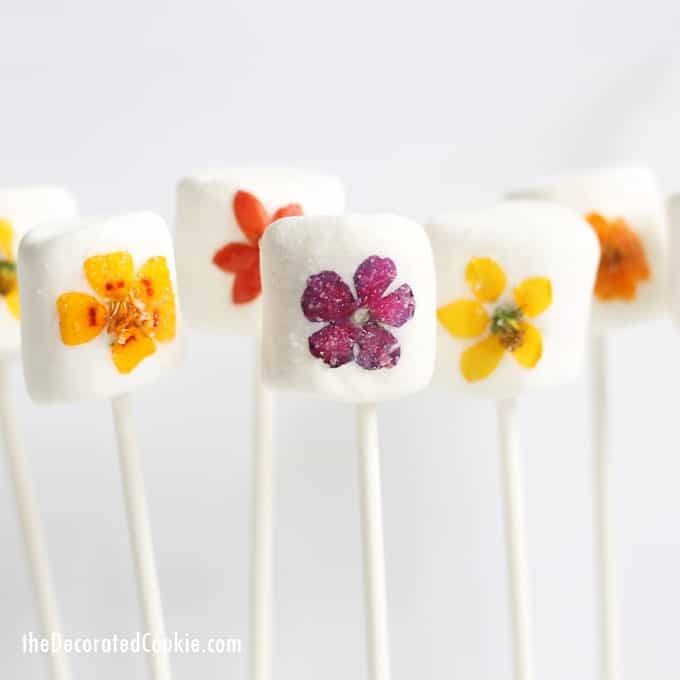 If you fear the edible flower, worry not. 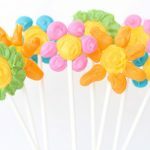 The sweetness of the light corn syrup and marshmallow absorb the texture and taste of the flower, so you’re left with just a pretty treat to eat. 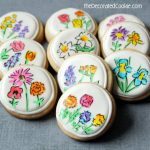 Edible flowers will be easier to find closer to spring, and you can even grow your own (as long as you use no chemicals). 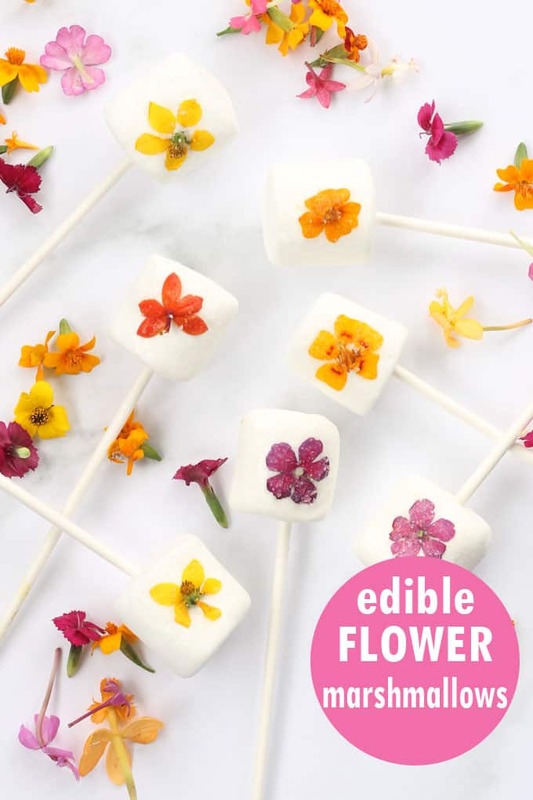 Many supermarkets or specialty supermarkets will sell edible flowers in the herb section, although this may only be seasonally. I purchased my flowers from Gourmet Sweet Botanicals and had a great experience. Shipping is expensive, because you’ll need to use next-day air, but I believe the quality and easy of the purchase was worth the cost. Always google a flower to be sure it’s edible. Some examples are: Begonia, calendula, carnations, chrysanthemums, cornflower, dandelions, day lilies, gladiolus, hibiscus, honeysuckle, impatiens, lilac, marigold, pansy, primrose, Queen Anne’s lace, roses, scented geraniums, sunflower, and violet. Skewer the marshmallows with the lollipop sticks. Try and make your flowers as flat as possible by pinching or cutting off any stems. Lightly brush the front of a marshmallow with light corn syrup. Attach the flower and press flat. Gently brush additional corn syrup on top of the flower. Sprinkle with a pinch of sugar.